A delegation from the International Olympic Committee (IOC) today concluded a successful Orientation Seminar (14-15 November) with representatives of Tokyo 2020, including the Japanese Minister of Education, Culture, Sports, Science and Technology, Hakubun Shimomura, who is also responsible for the Tokyo Olympic and Paralympic Games for the National Government; Tokyo Governor Naoki Inose; and Japanese Olympic Committee President and IOC member Tsunekazu Takeda. The two-day meeting, which comes a week ahead of IOC President Bach’s and Coordination Commission Chairman John Coates’ first visits to Tokyo, and two months after their election as host of the 2020 Olympic Games, will help the Japanese organisers to successfully negotiate the crucial transition phase, as well as allowing them to get a flying start, as they prepare to deliver the Games over the next seven years. Led by the IOC’s Executive Director for the Olympic Games, Gilbert Felli, the delegation, which was joined by International Paralympic Committee (IPC) CEO Xavier Gonzalez, shared with the local organisers and their partners advice on managing the Olympic Games and Paralympic Games; the key milestones that occur during the lifecycle of an Organising Committee; and the key factors to be looked at during the transition period. In addition, they laid out the framework of partnership that will guide preparations for the next seven years, and outlined some best practices from previous Games. 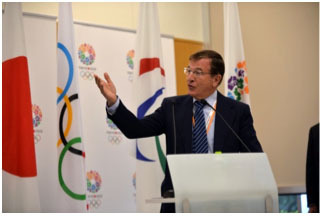 Despite bidding farewell to the IOC delegation, Tokyo 2020 is already preparing for another IOC visit: that of IOC President Bach and the Chairman of the IOC Coordination Commission for the Tokyo 2020 Games, John Coates, on Wednesday 20 November 2013. It will be President Bach’s first official visit to the Japanese capital, where he is expected to convene with representatives of Tokyo 2020 and the local government.